Bike Tow Leash – Yellow | Springer Jogger Versus The Competition! 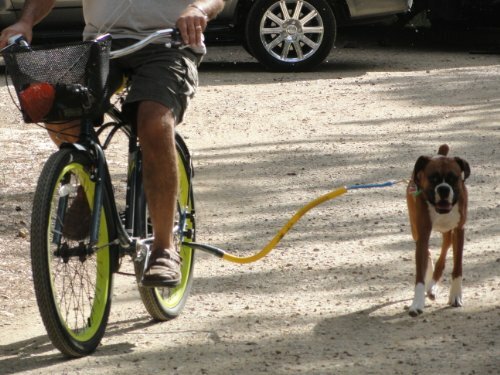 We are currently testing another similar product, the Yellow Bike Tow Leash. So far we are really impressed and our dog is enjoying it greatly! It works pretty similar to the Springer Bicycle Jogger, but different people I have talked to have their own preferences. Watch the video above, then click here for some other people’s reviews! It has 4.7 Stars with 197 Reviews. After a couple of months testing the Yellow Bike Tow Leash is performing well! This amazingly safe product attaches directly to your dog’s collar and it allows your pup to jog alongside you while you take your bike out for a morning, afternoon or evening spin. The versatile Yellow Bike Tow Leash (the name is a little weird, as I also have a seen a red version, which I have can’t figure out how it is different) has impressed us as well as many other happy customers that we have found online. The reviews are phenomenal to say the least, and the only minor complaint we’ve ever read is that it’s a bit costly in price, but so is the Walky Dog. But your safety and the safety of your dog are worth every penny in our opinion. •	Creates a barrier between the bike and the dog – this is important because you do not want your dog constantly hitting into the bicycle while you ride. This could make for a very bumpy ride and potentially cause unnecessary accidents. By creating this barrier, it is creating a measure of safety for you and your dog. And that’s the most important thing because biking with your jogging dog should be fun and you shouldn’t have to be scared of either of you getting hurt because you accidentally crashed your bike due to the dog bumping into it too often. •	The leash communicates with your dog – this is our favorite feature and benefit of this leash. The communication between bike and dog is crucial for safety purposes. As an example, if you are about to make a right turn to begin riding down another street, the leash will communicate this change to your dog so that he or she knows to turn right along with you. This communication will prevent accidents and unnecessary injuries and it’s wonderful and you will certainly appreciate it as a bike owner and dog lover. •	Safety is the name of the game – the Bike Tow Leash is one of the safest dog bike leashes currently available today. It surpasses many of the other products in safety because of the design. The design takes the laws of physics and your dog’s behavior into account and has compensated for both to make the perfect bike dog leash. With many other products, if the dog were to pull you sideways you would tip over. Not with the Bike Tow Leash. You’ll never have to worry about tipping over in that way again because this design will prevent it from ever happening to you and your pooch. All in all, if you love riding bikes and you love taking your dog out on pleasurable and exciting journeys, then the Bike Tow Leash is going to be an excellent addition to your fun filled excursions.